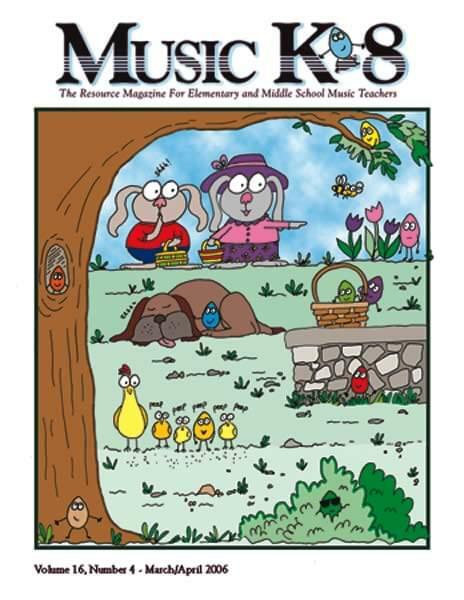 Songs - MUSIC IN OUR SCHOOL (Low C, D, F, G, A, C); HUNTING EASTER EGGS; MY EARTH; IN THE PAGES OF A BOOK; AN IRISH LULLABY; OLD JOE CLARK; TEST ME; CRESCENDO; DECRESCENDO; I CAN'T SNEEZE! ; Flashback: COME THE SPRING; WHACKY SPRING FEVER; MARACAS (Low C, D, E, F, G, C; OPT. PT. 2 Low D, E, F, G). Articles - About the Music in this Issue; The Hurdy-Gurdy Band, Multicultural Focus; School Music Still Matters; What Time Is It?- Carol's Corner; Network; Quodlibet; Photo Journal... and more!